Neumann’s TLM 49 is specifically tailored for vocal performance. 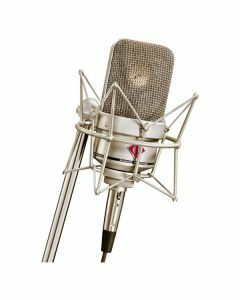 A large-diaphragm studio microphone with a cardioid directional nature and a warm sound, it ships as a package with an elastic suspension. Of course, the TLM 49 has the classic Neumann fine matte nickel finish. The design tips its hat to the legendary M 49 and M 50 microphones of the 1950s. The U 47 and the M 49 also act as inspiration for the mic’s “sound design”. The TLM 49 guarantees low self-noise and use of high gain levels, by pairing its vintage aesthetic with established Neumann transformerless circuit technology. Thanks to the unique capsule construction, the TLM 49’s large-diaphragm capsule delivers a cardioid directional characteristic with a tendency toward supercardioid. High frequencies are more directional, as was the case with the M 49. The capsule diameter is 34 mm. Also deployed in the M 49 and the U 47, the TLM 49 utilises the renowned K 47 capsule. The capsule is guarded by a big microphone headgrille, which is acoustically expansive and therefore sound neutral. It has a linear frequency response up to the upper mid-range. Above 2 kHz there is a gentle presence boost up to 3 dB.